Brilliant Super Mirror perfection. This pickguard is made of high grade non-magnetic stainless steel polished madly to a super mirror. Beautiful 100% corrosion free stainless steel. PLEASE NOTE: Be aware that Full Mirror Metal guards are normally not expected to stay a 100% perfect mirror surface, and will show minor fine surface scratching through use. It still maintains a high mirror finish, and any fine marks through normal handling and playing are not so noticeable from a few paces away. Pro-Steel are very careful with handling and preparation to get you the best Mirror Guard delivered. Stainless Steel is also a very effective EMF noise shield. 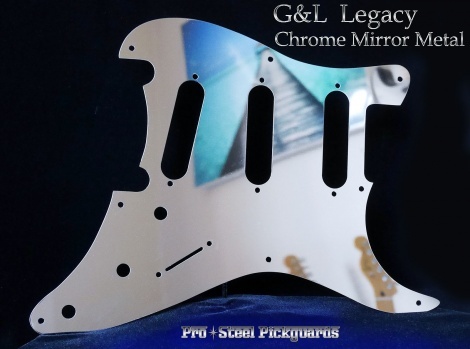 FITS - G&L Legacy SSS and S-500, Special, Tribute, or to replace similar genuine G&L SSS guard. If you need a hole for a Mini Toggle Switch let me know. I can do this free.